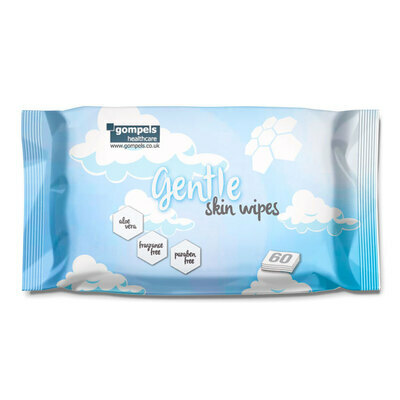 A gentle alternative to other options on the market, our Gompels Gentle Wet Wipes have been formulated for use on both adults and babies. Designed to leave the skin feeling cleansed and fresh, these moisturising wipes are pigmented with natural Aloe Vera while locks nourishment below the skin's surface. Suited to a wide range of tasks from nappy changes to removing makeup, each dermatologically tested wipe is paraben, fragrance and alcohol free and has been carefully formulated here in the UK. The large 60 pack size offers economic results with each high-quality wipe holding firm against tearing and offering extended cleaning. All these wet wipes come in durable packaging with a peel back opening that can be resealed after use to maintain their moisture. For nursery customers, why not consider trying out Gompels Baby Nappy's? Offering comfort and high-quality absorbance at every single size, they offer a more economic alternative to the leading brands available today.